This is a look at the (CCDW) class that I teach. You will learn a lot about the KY gun laws; I make sure that you understand. Talk and demonstrate a lot about safety at home, while carrying and on the range. How to handle yourself when Law Enforcement Officer stops you. Go over the principles of marksmanship. Live fire of a handgun, at a full silhouette target that is 7 yards away. You have to shoot a min of 20 rounds and hit better than 50%. The care and cleaning of your firearm. Take a written test of 25 questions. The class lasts all day. I get started at 8 a.m. and finish around 5-5:30 p.m., depending on the size of the class. My cost is $75. You can send me a check. Make it payable to Robert G. Adams. I now only do groups for the ccdw class I have to have 4 paid in full students to do a class. I will do in-home classes too. Call or e-mail for more information. After you go though my class, about 3 weeks later you will need to go to the Sheriff’s office in the county you live in and apply for your CCDW. The cost for the license is $60 for 5 years. You must renew it every 5 years. 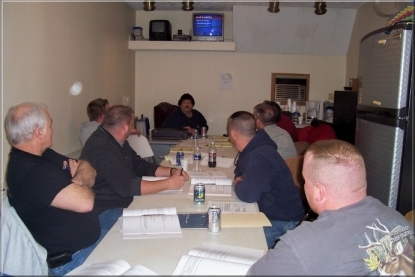 The class is held on US 127 north Owenton Rd. in Franklin Co. It’s only about 2 miles from the Frankfort city limits. I do not live there, but it’s a good friend that lets me teach it there. It’s convenient because we do the class and shoot back on the farm. I will do IN-HOME CLASS (I will come to your place and teach the class.) SOME RESTRICTIONS APPLY. I will give you copy of all the states that honor the KY license. If I hear about any laws changing after you go though my class, I will send you a copy of any new changes. Contact me when you hear about any new changes. If you are looking for the best deal on guns I will try to find the best deal for you. I just wanted to let you know how much I appreciated you letting me sit in last Saturday when my wife, Connie, took your class. I think you did a great job conducting the class. You were very thorough and made sure your students understood that safety comes first when handling their weapons. You clearly stressed the laws and responsibilities of carrying and using a concealed weapon. It was good for me to sit in because I was able to pick up some points that I didn't receive from my first class. We have a few friends and family members that are considering taking a class and we will definitely recommend you and pass your card along. Keep up the good work! or CLICK HERE TO VIEW THE CURRENT POSTED SCHEDULE.